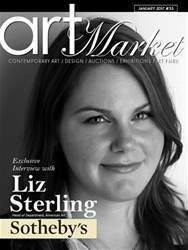 (1 Customer Reviews) | Write Review 12 issues per year Art Market Magazine. The International Magazine for contemporary Fine Art. Bringing you inside the global art world with more access and insight to the people, places and events that shape our industry. With deeper focus on auctions, art fairs and exhibitions from all over the world, interviews with the new emerging artists and coverage of the most updated and neat Fashion&Art collaborations. New style, New content, New International Art Magazine. With 2017 underway, the New Year promises to be one of the most exciting ever for International Art Market Magazine. In in just a few years, we have continued to grow in size, and we hope to continue this trend for this year! In this period time of the year, where big changes are happening in the USA, we decided to feature a most exclusive interview with Liz Sterling, Head of American Art department, in Sotheby's, and asked her about the past year in auctions and her expectations for the upcoming year 2017 in the American Art field. More than that, you will find here, International Art fairs & exhibition coverage, and special articles featuring extraordinary emerging artists and most known artists from around the glob. With much appreciation, we would like to thank the brilliant Denis Taylor, a long-time contributor that will no longer be writing for the publication this year, And to remind the changes of publishing: the digital magazine now changing to a quarterly schedule while Art Market Magazine will now feature two additional issues per year with the announcement of the bi-annual Gold List special edition of Art Market Magazine, which will be published on the 25th of March and December respectively. These are Big changes, and we could not be more excited! Enjoy the 2017 First Issue! 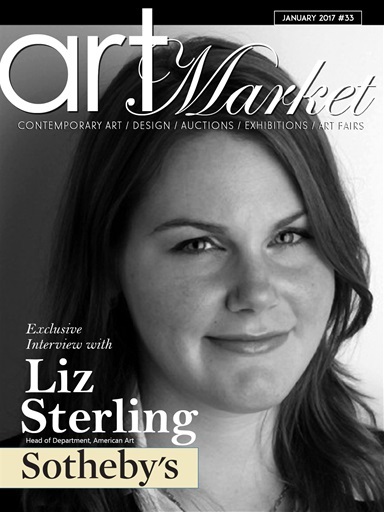 Art Market Magazine. The International Magazine for contemporary Fine Art. You'll receive 12 issues during a 1 year Art Market Magazine magazine subscription. Love this magazine! young and updated, show the contemporary art world from a new perspective, very recommended! You'll receive 12 issues during a 1 year Art Market Magazine magazine print subscription.